Thank you for participating on Phil Kavesh’s special presentation with Clear Law Institute entitled, “Proper Post-Death Administration of IRA Beneficiary Trusts”. For your convenience, we have put together a few tools and resources that we think you might be interested in. As noted on the webinar, we are offering all attendees a complimentary IRA Trust Post-Mortem Checklist—a 10-page Microsoft Word modifiable document for you to use in the implementation process. Once you complete the form above, we will e-mail you your complimentary checklist. We have a number of products and resources that can help estate planning professionals with implementing and adding IRA Beneficiary Trust planning to their practice – – quickly and easily. These products have been licensed to estate planning professionals for over 10 years and at a very reasonable one-time licensing fee. 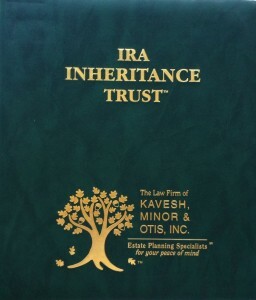 Sample binder (not as shown above) of the complete document assembled (including tabs) so you can see how Mr. Kavesh’s law firm packages and delivers this unique trust to his clients. As noted on the call, we have a number of other products related to IRA Beneficiary Trust planning that you might be interested. Also, be sure to check out www.irainheritancetrust.com to download a number of articles and free resources.